The College of Family Physicians of Canada is pleased to announce that the official launch of the new Mainpro+® platform. The new online reporting platform will make accessing your credit summary, completed activities, in-progress activities, and official transcripts, much easier. The CFPC has made some significant changes to Mainpro, based on member recommendations, to help all Mainpro participants meet their changing learning requirements. The system changes will also ensure that the appropriate mechanisms are in place to allow Mainpro to evolve and improve over time. We understand that change can be challenging at times and want to ensure all our members and Non-member Mainpro participants have a successful transition to Mainpro+. 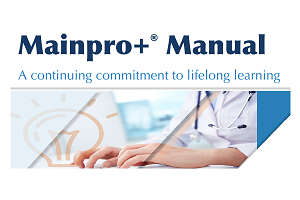 Click here to download a copy of the Mainpro+® user manual.